Cultivation is a game about the interactions within a gardening community. The resources needed for genetic propagation are tight, and relations can become tense. Cultivation explores self-interest, the common good, conflict, and compromise. While the concept is brilliant, and the game seems like a peaceful gardening game, do not be deceived. 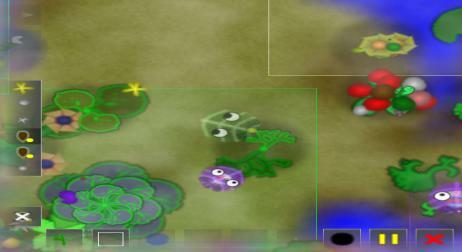 At first the concern is planting and cultivating plants to grow fruits, stay healthy and reproduce, the game quickly takes on a rather more absurd nature. I don't know whether this was the designers intention, although I suspect/hope not, but the small island that you live on very quickly becomes overpopulated, which is fine, you must just compete to be one of the survivors. However, for some reason you are able to poison patches of ground to make them infertile... Here comes the brilliant part, as soon as the ai is poisoned, it goes mental and ruins all of the attackers plants... And naturally the ai is programmed to use the poison anyway, including against other ai. Long story short good luck surviving the required three generations, as within two my entire island was uninhabitable, and I had nobody left to breed with anyway.